....I have had a couple of hard weeks recently; I have been overloaded with work, taken to the Kyzyl Kum desert for a field trip (not a nice trip in the summer), and had to go to a doctor and now I am receiving a rather unpleasant treatment against some inflammation. So, I haven't really had time and energy for the blog, but I will improve. Today I took a break from work and made this collage with one of my favorite Russian shawls, Sadko. 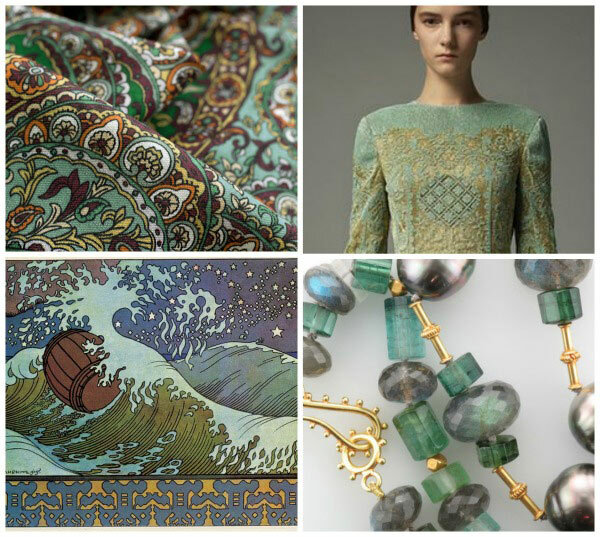 The shawl is made at Pavlovo Posad Manufacture in Russia; dress is Valentino Pre-Fall 2014; necklace is from a lovely Etsy shop, and illustration is by Ivan Bilibin. I love the cool green colour - this is just what I need to see after a trip to that desert. I do not have this shawl for sale anymore, but I have many others - you can check them here. So sorry to hear about your difficult times! Beautiful mood board, though. I hope things look up again for you soon! Thank you very much for your kind words and wishes! Hope you feel better soon, and that you are under less stress. The colors in your mood board are beautiful and calming. I LOVE the dress. Hi, Eugenie! Long time, no see! :) I am finally back online and slowly catching up on my blog readings after the long absence. I love your cool blues, and hope that you have recovered since your last post and are feeling calm and refreshed.